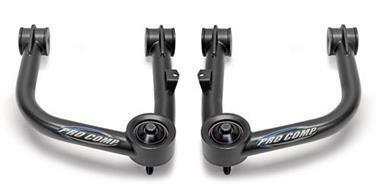 The new Pro Comp Pro Runner Control Arms deliver amazing performance and increased durability for lifted, leveled or stock trucks. The factory upper control arms have weak ball joints and stamped steel construction that is not designed to handle off road use. 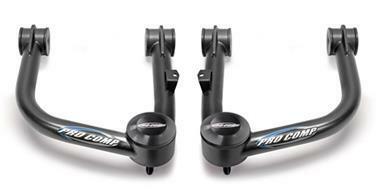 Pro Comp has engineered the new Pro RunnerTM Control Arms utilizing oversized stainless steel FK uniball joints. The big uniball joints provide unparalleled strength over factory ball joints. 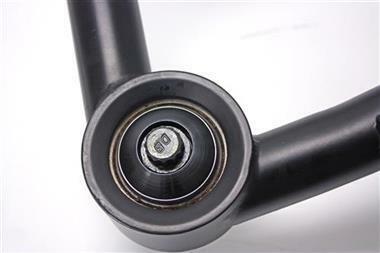 Heavy duty 1.25” chromoly tubular construction and reinforced pivot bushing mounts are used to eliminate flex and handle the added load from extreme suspension cycling. Large PTMEG pivot bushings are equipped with zerk fittings for easy maintenance and quiet operation. Each arm is finished in a durable black powder coat finish for years of lasting performance, and includes a billet machined dust cap to keep dirt and debris out of the uniball.